Do you have a little voice in your head that informs you of your food cravings? You know what mine has been saying lately? So earlier in the week I picked up some pre-made corn hard taco shells at the grocery store. And last night was taco night! 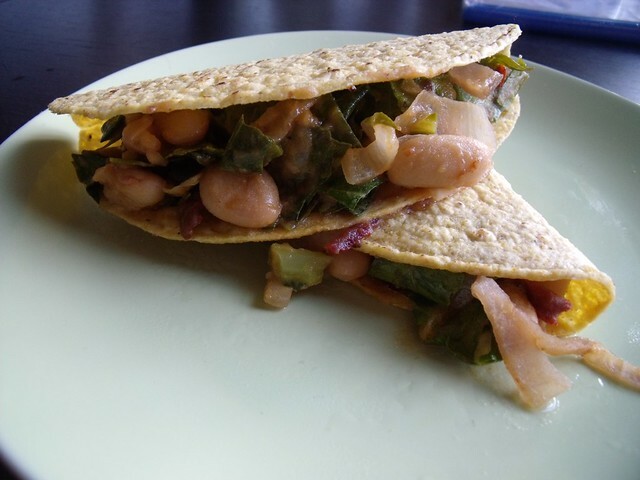 I thought I’d healthify the tacos with a whole bunch of greens and beans, so collards and white kidney beans it was. Mmmm. I used one of my favourite spicy peppers here: chipotle. Chipotle peppers are smoked jalapeno peppers, and I buy mine in a can labeled: “chipotle in adobo”. The adobo part is a seasoned tomato sauce that is just to die for. Whenever I open a can I have a hard time refraining from just eating the spicy adobo sauce. 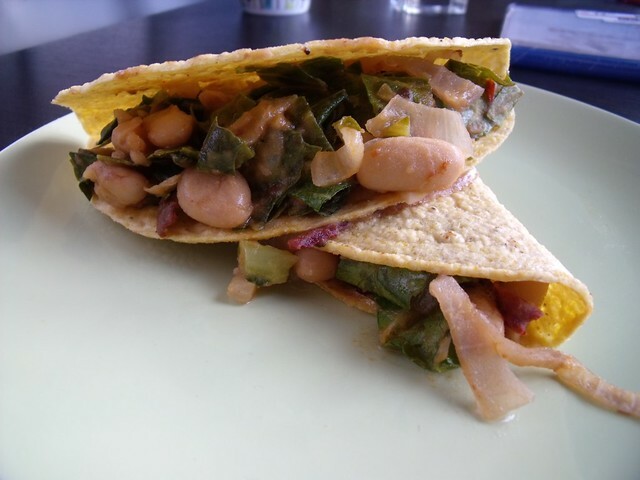 These tacos are a great way to get in your greens for the day. And the boyfriend ate even more tacos than I had anticipated with great delight, so you know they are man-approved. I hope they satisfy your taco cravings too! In a large pan, heat olive oil over medium heat. Add onions and garlic, and sautee until the onions are translucent, about 5-10 minutes. Add the collard green stems and saute until tender, about 4 minutes. 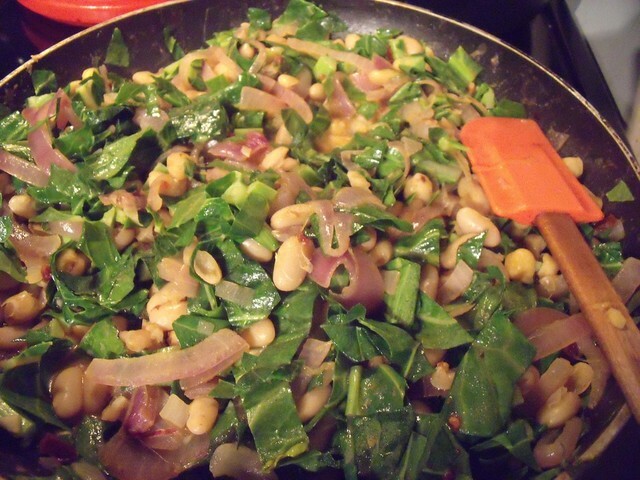 Add the kidney beans, chipotles, cilantro, and salt, and collard green leaves. Saute until the collard leaves are bright green, about 2 minutes more. If your mixture starts to stick, add in about 1/4 c. of water and continue to stir frequently. Lay out your taco shells on a baking sheet, and heat at 350F for 5 minutes. 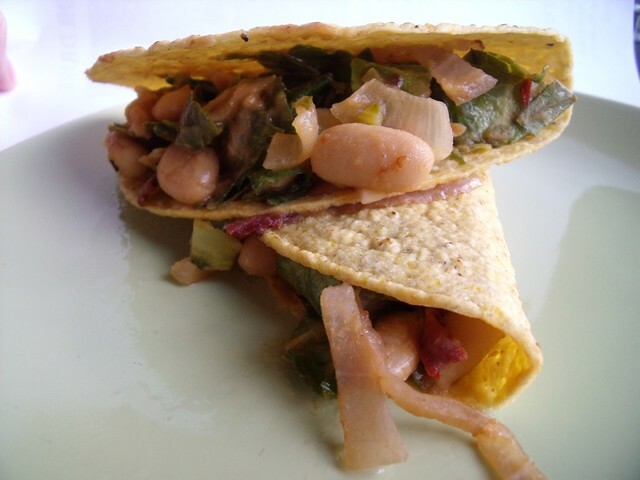 Remove shells from the oven and fill with the greens & beans mixture. Looks delicious. Will have to give it a try. I think it would also be great with Swiss chard or kale!! Wow these look absolutely delicious! This looks so good! Def. not your normal taco filling!